TARAT! TARAAHH! !–a sauce for all seasons–TARATOR! Discovered this sauce while looking for an alternative to yogurt. Meredith is cutting out dairy products for a few weeks while she takes advice from an ayurvedic practitioner in Albi. We’ve been we eating mainly vegetarian–and more lightly in the evenings. It is a challenge for me and I’m enjoying it. New Directions I’m calling it and it will be a chapter in the new book Healthy Eating for life. 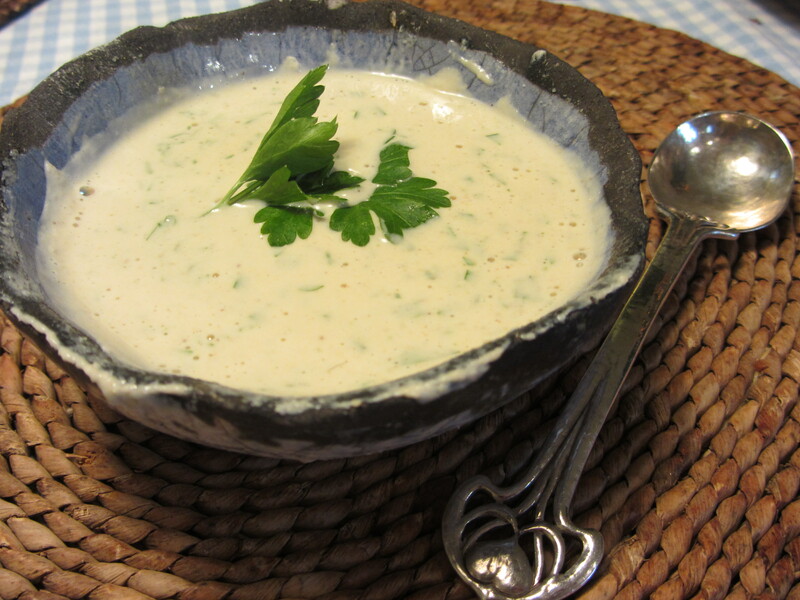 Tarator is variously described as a yogurt soup from Bulgaria and a sauce from Lebanon. 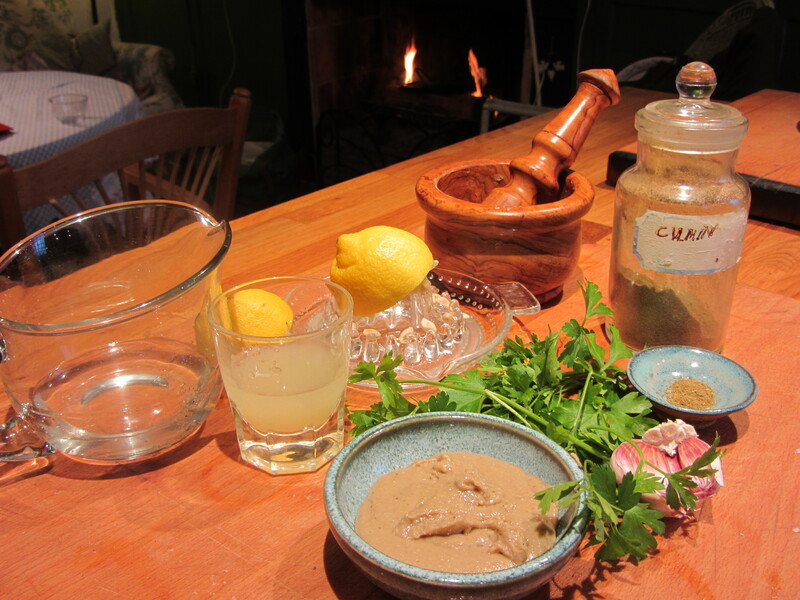 My version of this tahini based sauce is loose, lemony and lightly garlicky, to be enjoyed with meat or vegetables. 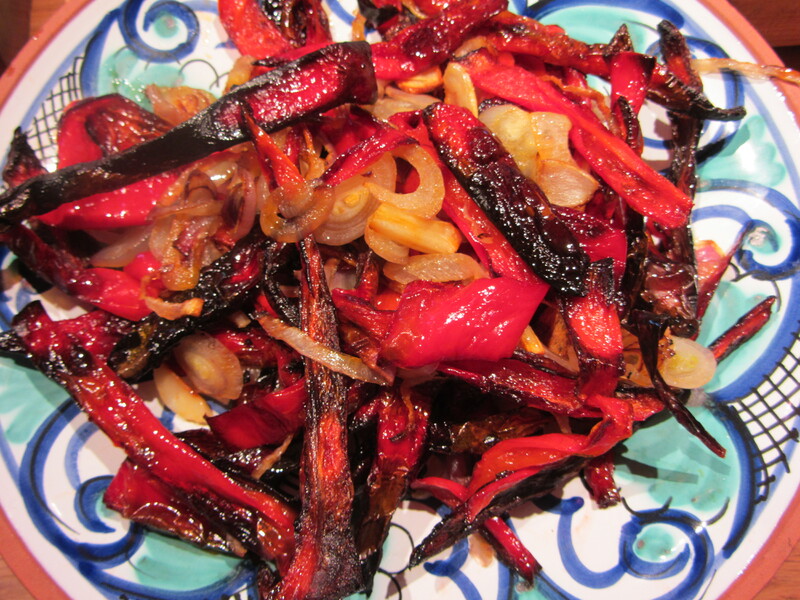 For lunch today I’m revisiting a salad from Delicious Dishes-–Roast Red Pepper Salad with an edge–(recipe tomorrow). We had the sauce with it and enjoyed it. Put the first five ingredients in mixer and whizz to a smooth runny consistency. Add more salt to your taste. Have been a huge fan of tahini since the early 70;s. Its great with falafel patties and sauerkraut. (Yes sauerkraut!). Looking forward to your new cookbook. Sounds delicious – like my recipe for hoummous without the chickpeas. Hoummous is also good as a general sauce on almost any kind of vegetables and tyhis recipe sounds very suitable for that. I am also trying a largely vegetarian diet but for an amazing feast with friends i tried Madhur Jaffrey’s curried roast chicken (fantastically tasty) served with spicy roast sweet potatoes & fennel; couscous with herbs, spring onions, fresh chilli, toasted nuts/seeds & dates; quinoa with cherry tomatoes, celery, spring onions & herbs with vinaigrette; bean & pea salad. It was so delicious and filling but all so healthy and free from any sugar or additives. My friends agreed it was the best meal they’d had in years. None of them had eaten quinoa before and most of them thought they didn’t like sweet potatoes or couscous! The best thing is I have loads left over for next weeks’ lunch boxes!! I felt inspired by your posts and – with the exception of the chicken – the entire meal was vegetarian and dairy-free! Wonderful. I want to try the chicken. What a treat!–thank you both. We will be taking a break then so can’t make it to the old (beautiful) stomping ground–appreciate the invite though and happy erm- erm- birthday Juliet! J’ai aussi vivre en France, well Corsica. I love trying your recipes, and this one looks interesting, I have tried to find Tahini paste here without success. Can you tell me where you find it please. Some of the supermarkets here are not very adventurous with l’alimentation du monde. Claire bonjour. I buy it in the Bio stores here–we have a few. You could try the Bio section of the supermarchés. Thanks Robin, I never thought of that, I shall have a look in the Géant, our biggest store next Time I’m there. Hope you are doing fine after the recent operation. Yes, it’s important to have regular check-ups with the doctor. Over the last few months, I have been fighting a serious illness caused by something in the environment. Hospital treatment had been making me really sick.